Today the manufacture industry is completely relying on the computer based numerical control machines, which are called as Computer-Numerical control or CNC. They perform the operations which are earlier performed by engineers. Earlier equipment like routers, vertical millers, shaping machines, and center lathes were operated by engineers. But today even these operations are taken care by CNC machines. In some cases these CNC machines have even completely replaced operator required equipment. This is the main advantage of CNC machining and that is why majority of the manufacturers are choosing this for operations like fabrication and applications manufacturing. CNC machines come with expedient, precise production, and efficient production capacity which is best suitable for manufacturing items in large quantities. These operations otherwise require canter lathe, grinder, router, vertical miller, and even shaping machine. But the computer-numerical-control machines offer come with lot of production and financial advantages as well when compared to the conventional method of manufacturing. For example, manual lathing demand skilled technician for each and every machine. But in case of CNC machining, it requires a single person who can take care of all the operations. Initially CNC machine’s manufacturing was done by U.S. Air Force in 1940s. At that time as a driver, these machines were using punched paper technology. Now they are evolved and they use digital software. CNC machining which are primarily used by the manufacturers is a process which is used to produce items, products, and machined parts. To accomplish this process they make use of CNC machines. Rather using machines tools like mills, grinders, routers, or lathes, CNC machining makes use of computer numerical control. This computer numerical control is different from normal PCs when it comes to the software they use for controlling the machine. This software is highly customized and it is programmed using G-Code. G-code is a CNC machine language which helps in precise controlling of features like feed rate, coordination, location, and speed. The computer looks like very sophisticated desktop with G-code infused software in it. A programmer who sits at the computer console will help in commanding this machine and this is equal to several operators who work at routers, grinders, lathes, mills, and shapers. Through this method of computerized and automated machining, it is possible to achieve holds, reaches, and many more actions which are not possible to perform by conventional machines along with the human operators effectively. For manufacturers this CNC machining method is very useful since they need large quantity of plastic and metal parts usually in very complex shape. There are CNC machining which provide the benefits of multiple axes which adjust all different angles in helping to manage even the materials which are hard to cut. Even the basic machines come with cutting implement and X-, Y- axes which work independently but simultaneously. But an advanced machine will have five or more axes which perform in a similar way and they will also have capacity to flip and turn the parts. So, in these machines the Z- axes will more up and down. It is possible to automate the jobs like the ones with several cuts using the CNC machines. The spindle or router here will turn the cutting implement and this looks like drill bit. The actual drill bit will perform cutting at the tip, meantime all other router bit will cut the material. 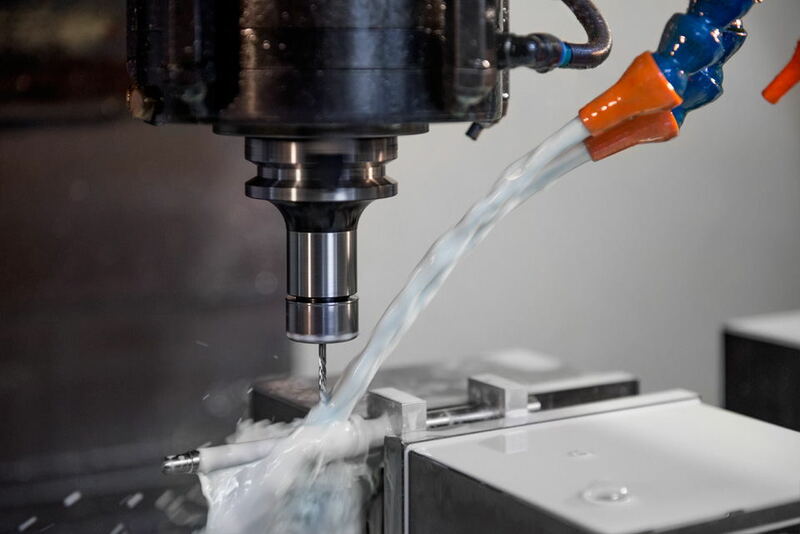 Both these conventional and CNC machine aim for the same, they both start the process with raw chunk of either plastic or metal and turn them into part. Most important thing here is CNC machines follow automation and the conventional go for manual process. Accuracy, production rate, and the speed are major advantages of CNC machines compared to conventional machining. In case of CNC a skilled worker will use software and through which he cuts the part. In case of conventional a skilled employee makes use of entire set up and he operates the actual machine. In case of manual process, the skilled worker will have responsibilities of setting the gear, whereas in case of CNC machines, there is no role for gears. One must remember that, conventional process comes with less cost and it is always better for small quantity projects. But when it comes to large quantity projects, CNC is the best. CNC machining is not suitable for small ones since for small projects this is not cost effective. For example imagine a situation where a component demands imperial and metric threads, convex arcs, and 2 tapers with different degrees. For this if we use an automated CNC machine it will need 3 tools for cutting the part. But for the same component conventional machine may require more time and more than 5 tools.